AB 1738 is new law that amends Civil Code Sections 5910 and 5915 and makes two major changes to the requirements of internal dispute resolution (IDR) meetings held between an association’s board and its members. We opposed the adoption of AB 1738 (like just about everyone else who works with California HOAs) and discussed the reasons why in our September 3, 2014 blog article. AB 1738 has since been signed into law and became effective California law as of January 1, 2015. Here are the big changes – first, any agreement between the parties during IDR must be in writing and signed by both parties. This is a common sense requirement and will prevent any complaints about what was actually agreed to between an association and owner. More problematic, however, is the addition of language that now permits members to be represented by an attorney (or another person explaining the member’s position). The new changes that now allow members to bring an attorney will, without a doubt, end up costing community associations more money for legal fees, as more members may decide to be represented by their attorney, which will in turn require the association to have its attorney present. We would never recommend that an association’s board meet with an owner’s attorney without having the association’s legal counsel present at the meeting as well. 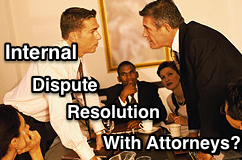 The owner’s attorney may try to direct the resolution, which may not be what is best for the association. Or that attorney may make the meeting more adversarial and contentious, not the informal “meet and confer” process that the IDR process was intended to be. The good news is that each party bears its own costs (although at one point the Legislature wanted associations to be fully responsible for the IDR costs of both parties). To make things more confusing, there is no notice requirement in this new law requiring that an owner give advance notice to the association if the member will be represented by an attorney. We can envision the owner showing up to IDR meetings with an attorney catching the association’s board member representative off-guard; this could lead to rescheduling and further delays. While it might sound self serving, we cannot recommend that the board allow the IDR process to proceed with the owner’s attorney unless the association’s attorney is also attending the meeting. This will ensure that the process goes smoothly and that no board member says anything incriminating which could be used in litigation at a later time, among other reasons. We recommend that boards ask the owner before the IDR who will be attending with them and consult with the association’s legal counsel regarding the IDR process. And each association should also confer with legal counsel to ensure that the association’s IDR policy is compliant with the new changes in the law.